Emerging from the streets of Americas north eastern cities such as New York, Chicago, Philadelphia and Baltimore, Doo Wop took its roots primarily from Blues and R&B to create an accessible vocal style which came closest to the mainstream pop style of the 1950s. 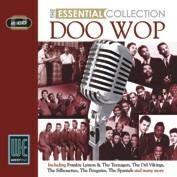 AVIDs Essential Doo Wop Collection covers the early influential vocal groups such as The Orioles, The Clovers, The Imperials and The Platters. We then move on to cover the classic Doo-Wop years of the mid 1950s with a string of classic vocal performances. Opening with the Frankie Lymon classic Why Do Fools Fall In Love the fun continues with more classics by Dion & The Belmonts I Wonder Why, The Spaniels Goodnite Sweetheart Goodnite, The Five Satins In Still Of The Night,The Crests Sixteen Candles, The Penguins Earth Angel The Silhouettes Get A Job (possibly the most popular Doo Wop song of em all) and many more. We also feature a host of not so well known names, many of them one hit wonders but boy what hits!! Take a listen to The Kodaks Make Believe World, The Love Notes Tonight, The Charts Deserie, The Continentals Fine Fine Frame and many more classics waiting to be discovered! So if you want to Dip Into Doo Wop, this is the place to start with AVIDs Essential Doo Wop Collection, a finely re-mastered 2CD set for your consideration!